We all want more speed for our websites, and now that search engines use loading speed as a ranking factor it’s even more important to make sure our sites load as quickly as possible. One of the quickest way to rev up the speed of your WordPress website is to install a caching plugin. Caching works on the idea that most website pages don’t change that often, so it’s not necessary to always go to the host server to download a fresh copy of the page each time a site visitor requests it. Instead, the visitor can be shown a static HTML version that is much lighter than the original WordPress page while still looking exactly the same. If the original WordPress page is changed in anyway, a new cached version is created and this is then served to visitors. The result is that much less data has to be accessed from the host server, speeding up file access and download times considerably. Depending on the plugin you use, caching plugins can also speed up your site by compressing files and enabling ‘lazy loading’ of images. With lazy loading, the images are only loaded when the visitor scrolls down to the part of the page where they are set (as opposed to loading everything at once when the visitor arrives on the page). Three caching plugins that you will often see recommended are WP Super Cache (free), W3 Total Cache (free) and WP Rocket (premium). Of the three, WP Rocket has perhaps the highest recommendation and is recognised as being very easy to set up. We can attest to that because it’s the plugin we have been using for our own sites and those of our clients. The bottom line after doing a few tests is that the plugin does indeed make a significant difference in website performance. As you can see, the second test without the plugin running was significantly slower than the first test with the plugin activated. We went from an ‘A’ down to a ‘D’ on pagespeed score. Needless to say, we reactivated Rocket right away. So if you feel your site is slower than it should be, the first thing you can do is run a speed test to get a better idea of what’s slowing it down. Try Pingdom or GTMetrix. Then install a caching plugin and run the test again. Hopefully you will see a noticeable difference in speed. Bear in mind that another factor that slows down sites is inferior hosting. WordPress needs to be hosted on powerful servers with enough space to dish up your pages swiftly. So if you’ve gone for the cheapest hosting option, it might be time for an upgrade. If you are an existing client of WebRabbit we offer an installation and setup service. 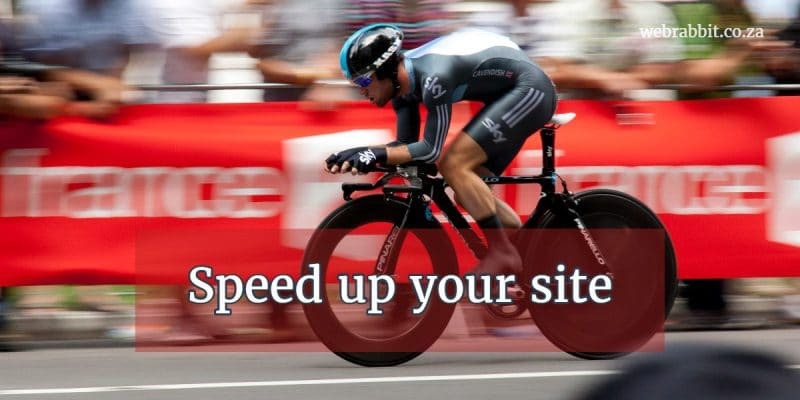 Contact us and we’ll give your site a speed boost.